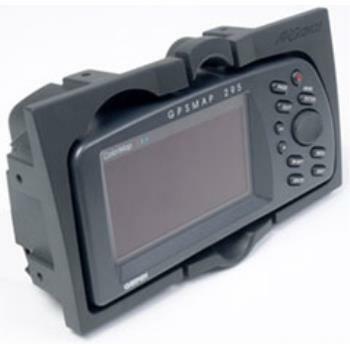 Our announcement of the Garmin 196/296 Panel Dock brought tons of inquires for a similar Panel Dock for the popular Garmin 295 handheld GPS. The 295 handheld GPS is somewhat wider than the 196/296 Handheld GPS units and therefore will not fit in a standard 6.25" radio stack. Not to worry as we have come up with a flexible mount that can be placed almost everywhere on the aircraft panel. As with the 196/296 Panel Dock, the 295 handheld GPS unit is held safely and securely. That doesn't hinder the ability to easily remove the GPS unit in a matter of seconds. The external power and antenna connections are made at the back of the unit. The cables for the external power and antenna connections are secured from falling into the panel with special keyholes machined into the dock.